Life doesn’t always go our way. In good relationships, when our mate is going through a rough patch, we try to be as understanding and comforting as possible. We love our mate so we try to accept their ups and downs and be there for them. We take the good with the bad. It’s a package deal. How can you be a supportive partner when things go wrong? What if your sweetie becomes physically ill? Depressed? Anxious? Or what if they’re stressed out over problems at work … maybe a job loss? Or maybe they lost someone close to them? Even a simple headache or a broken toe can set off challenges in a relationship. You may find yourself suddenly the comforter, the caregiver, the one who must step up to the plate for your mate when they need help. · Listen. Validate their feelings. Be affectionate and understanding. Show them you have faith in them. When trying to help your mate rebound from a difficult situation. · It’s not possible to wave a magic wand to make troubles go away. Both of you undoubtedly understand there’s no magic pill to dispel emotional pain. · Sometimes you have to tread a thin line when you try to help, try to solve your partner's problem. Encourage them but try not to exaggerate. Be realistic. · Don’t minimize or belittle their reactions and feelings. · You may be exposed to a range of emotions that pop up as a result of their stress. · Abide by their personal decisions. Some of us need more alone time to work out our emotional or physical upsets. Respect that. · Try to take away some of the burdens of everyday living while they’re working through a problem or recuperating. Accompany them to a health practitioner; to physical rehab sessions. Be a chauffeur if they can’t get around easily. Do little things to make them comfortable. A massage, de-clutter their environment. · Help them follow (adhere to) their treatment plan. Make suggestions. Help them with problem-solving. · Help and encourage them to continue doing activities they enjoy if they express interest … outings with friends, dinner parties, hanging out with you for some one-on-one time, give them as much opportunity to do what they enjoy and are able and want to do. Do you Feel Drained Being the Comforter? It’s natural that your mate prefers to discuss her/his troubles with the one they love – sometimes ad nauseum – but there’s a limit to how much you can take. They feel good when they’re able to let out steam; But when it gets to be nonstop or your mate becomes obsessed with a problem, you’re not doing them or you any good by letting them vent on and on. Other people you’ll need to consider – if you are parents – are your children. Keep an extra eye on them to see if and how they are reacting to their mother’s/father’s stress. Children pick up on discord more easily than you might want to admit. They can be extremely vulnerable when there is tension, anxiety, depression in the house. Your role as supporter can become extremely unpleasant. Your mate may not be at his/her best behavior when things don’t go their way or something unexpected happens. They may use you like a proverbial punching bag. Use restraint and empathy before throwing back some choice words or you could spark a shouting match, make your mate feel worse than they already do, and add tension to the relationship. Being supportive doesn’t mean you have to take everything they dish out, swallow your anger or hurt. It’s not unreasonable to react emotionally when something throws your mate off balance. It IS unreasonable for you to feel forced to put your feelings aside for a prolonged period with no end in sight while they work to get their act together. Your needs can’t be ignored indefinitely. Your mate needs to take some responsibility for their bad behavior, the way they treat you, and express restraint and gratitude when they’re depending on you. Both of you need to understand that in a loving relationship, what affects your mate also affects you. When your sweetie hurts, you hurt too. If your mate asks you to do something you feel uncomfortable doing, or they take some action that is upsetting and unacceptable to you, it’s time to discuss the situation and take a stand. If your mate is so distraught and can’t or refuses to understand your heartfelt concerns, it might be time to bring in a third party to help you mediate the situation. Counseling could be a way to iron out the conflict, unruffle some feathers, and see things from a different perspective and from an outside source. 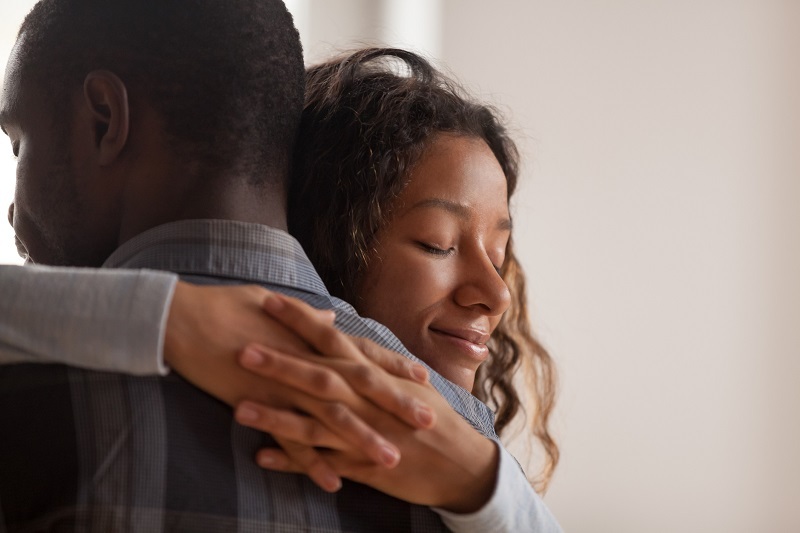 In an ongoing effort to keep the lines of communication open, head off some of the issues of comforting your mate in times of stress by having regular “meetings” to check-in on your mate’s emotional well-being. That way, when issues arise, you’ll have a frame of reference, perhaps a better understanding of your mate’s issues, their concerns, how they handle certain situations, and how best to help them. Keep each other in the loop daily or weekly with what’s going on in each of your lives, what issues might be nagging or lurking in the background that might potentially explode, and what strategies you might use to minimize the fallout. When each partner feels like they are not alone in the experience, that the misfortune of one is shared by both, and that you will continue to love and cherish your mate, you will minimize stress and come to a deeper understanding of one another – despite a turn of bad luck, an accident, tragedy or whatever life sometimes serves up. A lot can happen to a relationship in a year. Habits develop. Behaviors can get swept under the rug. Resentments can build up. Our busy lives can take over a large amount of our time. We can forget to express our gratitude and happiness and our sadness. We can take our relationship, our partner for granted, like we expect the sun to come up each morning. Just as we need a pat on the back at work, we need reassurance and encouragement – and so does our partner. It’s a new year. What a great time for a relationship review. What is a relationship review? Think of it as a progress report, a performance review … or if that sounds too formal, a ritual periodic check-in. Similar to the kind of review we participate in at work, it’s a way to evaluate our relationship progress with our long-term mate or spouse. One of the most important relationships in your life is your love relationship, most of us would agree. So use this time to reflect, review the highlights of the year just passed, consider what you love about your relationship, what you want more of, and what you want less of. Speak your mind. Try not to turn the review into a “shape up or ship out” mentality or that you’re renegotiating a contract. A relationship review isn’t about rooting out “the bad guy” or assigning blame. It’s about clarification, reassurance, better understanding, and growth. If you’re thorough and each of you do your part to listen, pour your heart and soul into it, the experience can be cathartic. It can bring joy and insight, and add a deeper dimension to your relationship. Yes, a relationship review is a kind of conversation. Let it be easy-going, informal. Give it some thought ahead of time, if you’re setting a date for the review. Jot down notes. I would discourage you from whipping out a clipboard and checklist during the discussion, pencil in hand. Not a good idea. Discretely glance at your notes if you need to. It’s a talk, not an inquisition or a review you’re having with your supervisor at work. Maintain a relaxed attitude and tone. At the same time, treat the process with respect. Designate a time to do it, a quiet place and a time without interruptions. Maybe sit on a loveseat, on a rug on the floor, or in bed (with clothes on), or sit at a table at a quiet café with a cup of tea or coffee. Sometimes the time and place happen spontaneously; something triggers you to have a discussion. Go with your instincts. If it feels right, collect your thoughts and dive in. · Give each other time to speak without interruptions – unless your mate asks a question or for your feedback. · Let everything up for discussion. Nothing is off limits, no sacred cows … whether it’s his annoying snoring or you being more emotionally expressive. · Take no offense. As long as your mate is expressing himself/herself in earnest, remain open and accepting. · Avoid shouting and pouting; nagging and criticizing. · Take responsibility for any behaviors and actions where you might have stepped out of bounds. Say you’re sorry if you messed up. · If there’s a debate over an issue (you think one way and s/he thinks another) find common ground, solutions, compromises, or work toward acceptance of what your mate in all sincerity believes they can’t change. · Express your love and commitment. · Starting out with happy reflections is a good beginning. How about sharing special memories? · What, if anything new did you discover about your mate this past year? · Not-so-special memories. This isn’t to call your partner out or make them be the bad guy (gal). It’s to let your partner know what you need and prefer not to happen again nor be a repeating pattern in the relationship. · Experiences where your mate was “there for you” or wasn’t. · Besides a review of the past year, include a discussion of what changes you would like to see in the new year, what you both intend to do now and in the future to secure the relationship. Some are tough questions. We might be uncomfortable with the answers. We might disagree with some answers. Don’t be afraid. Face the music; it gets easier once you get on rolling. · Do we have enough passionate moments, kissing, hugging? · Do we regularly express gratitude and appreciation for one another? · Do we praise and encourage each other regularly? · Do we have lots of fun together? · Do we enjoy being in one another’s company daily? · Is our time together focused or do we find ourselves distracted by our cell phones, calls, thoughts of other things like work or other pursuits? · Do we apologize for any emotional harm we caused one another – even if it was unintentional? The review in and of itself can be cathartic, productive. You may feel a renewed closeness and intimacy, like a weight has been removed because you expressed yourself, got stuff off your chest. You’re relieving emotional tensions, discharging pent-up emotions. In order to make it stick and fulfill your promises and commitment to one another and make changes, you have to take it to heart and act on what you say you will do. There’s magic when you express love. Expressing what you love about your mate is like a reflection. It bounces back. When you project love, you receive love simultaneously. Distance can be an obstacle to fanning the flames of love. Can a relationship survive and flourish when miles separate you and your sweetheart? If a long-distance relationship is something you’ve never experienced, you may have to put more effort into finding your way. If you’ve been in one before, you probably know what made it successful and what extinguished the flames, turning the spark the two of you had into a smoldering campfire. At first, you may be starry-eyed and think absolutely nothing – not even an ocean’s distance – will ever interfere with the connection you two have. That’s a good start! But blazing fires can burn out when you let things roll along without a reality check … paying attention to what you might be neglecting or refusing to accept when two people can’t connect face-to-face on a regular basis. Try giving a new long-distance relationship a little time, like shoes you’re breaking in. By time, I don’t mean just let time go by and see what happens. Besides cruising along to see how things feel, make an effort at communicating frequently: telephone calls, text messages, emails, video chats, cards, letters. And, just as importantly, try as often as possible to make those interactions long and meaningful conversations more than short and sweet. Bridge the distance by interacting as if you were close by or even in the next room. Did you remember to ask about that important meeting he had? Did you share the joy she felt when she got on the scale and reached her target weight? She just finished a great book and she wants to share passages with you; are you available to spend time to listen and enjoy experiences that are important to her? Sure, you have a life outside of your relationship – work, friends and family, obligations, eating, sleeping, and laundry. Here’s where setting up your priorities and time management make a huge difference. Making the effort is a statement in itself to the commitment the two of you have to one another. Close the distance gap. When you can’t be there to hold, kiss, and reassure your mate face-to-face, take the next best route: Facetime (or use your favorite video conferencing app). Have some planned activities when you do get together but keep it flexible. Planning in advance doesn’t have to mean creating an itinerary of hour-by-hour or day-by-day activities or excursions. Let things flow naturally. Go to the movies, take in a live music performance, hike in a nearby park, arrange a candlelight dinner. Sit and hold hands in the park. Mix it up. Include spontaneity. Talk! And sure, a road trip or a vacation to some far-off exotic destination is exciting and romantic. You’re creating memories and intimacy. The important element is making the most of your time together, no matter what you’re doing and where you’re doing it. You know how the mind can sometimes play tricks. Doubt can set in. Maybe he hasn’t been in contact with you every few hours like he did at first. Maybe you’re creating fictional reasons why she didn’t seem as excited to hear your voice earlier that day. Maybe you’re feeling “cheated” out of a “real relationship” because you want to be there with him in person more often than she is able or wants to. Are you depressed or sad about something in the relationship? Be diligent about keeping a level head. Be rational. Question any feelings of “neediness” as well as other feelings and behaviors that don’t “sit well” with you. Allow them to come to the surface and examine them instead of burying them in your subconscious. Talk to yourself and to your mate directly and honestly about what you’re feeling. If you’re acting a little insecure or even paranoid about something your mate said or didn’t say, share that. Be careful not to overgeneralize their actions and behavior, steering you in a direction where you question everything, leading you to possibly question the relationship as a whole. Try not to overreact, making a mountain out of a molehill, when a couple things upset you that might be able to be resolved in a no-holds-barred discussion. Also, keep in mind that it doesn’t automatically have to be the distance itself causing you to feel the way either of you feels and acts. Issues come up even when distance isn’t a factor. On a more positive note, consider that distance can strengthen the love and desire you feel for each other. Consider that the time you spend together is precious and that you cherish them and look forward to the next time. Having similar goals is so important when you’re working at having a solid relationship – relationship goals as well as professional goals. Do yours and theirs mesh? Do either of you travel a lot for work? Are you each comfortable with the hours you each spend working and doing other things? Do you both agree that you can survive a long-distance relationship indefinitely? Do you both feel that converting to a not-so-distant relationship would help the relationship grow? In other words, do you both want the distance to be temporary or permanent? If temporary, do you both agree there are some built-in benefits to spending your temporary time apart? Discuss them. Examine the differences in how you each feel about those benefits. You are an individual with a distinct personality. Another thing to consider is that distance doesn’t alter your personality or theirs. But, geographic distance between you could be keeping you from really getting to know your mate. Thoroughly talk about what you like and don’t like, how you like to interact, past experiences that might be having an effect on how you and your mate relate to one another, behave with one another – hot buttons to warm fuzzies. You’ll want to understand what feelings, expectations, desires, and personality traits might be causing certain feelings or behaviors to surface. Not to put a damper on the uplifting feeling of love, intimacy, and deep friendship, I like to think of a long-distance relationship as an investment – a love investment of time and attention. Nurture it, be patient, pay attention to fluctuations, encourage it and watch it grow. There are as many reasons why long-distance relationships work as there are reasons why they don’t. My point is, you and your mate have a lot of control over its success or failure. Having desire and commitment can make geographic boundaries irrelevant.